Nortrom, the Silencer, is a ranged intelligence hero that can serve as a carry, support, or even an initiator. Armed with an array of anti-magic abilities, Silencer puts a hard stop to teams that rely on high-impact, all-or-nothing type spells such as Enigma and Magnus—while annoying and irritating those that rely on their own intelligence stats and mana. At any stage of the game, he is able to effectively impair and stifle enemy spellcasters, even when he isn’t within close proximity. His signature skill Global Silence facilitates this, allowing him to prevent the usage of all magic for a few seconds no matter where he is on the map. Global Silence can be used both proactively and reactively, making it one of the most versatile ultimates in the game. His other anti-magic abilities Arcane Curse and Last Word complement Global Silence, and are there to further disrupt the opponent and their spells. Arcane Curse punishes trigger-happy spellcasters, damaging them for a greater amount over time should they choose to use their mana frequently through the ability’s duration. Should they choose otherwise, it is essentially like silencing them, sealing away their magic underneath a powerful affliction. Last Word, on the other hand, damages a target heavily if they cast a spell during the debuff timer, or if the debuff timer runs out. What is truly unique about Silencer’s kit, though, is his attack modifier Glaives of Wisdom—which applies a Pure damage bonus to his regular attacks based on a percentage of his intelligence. 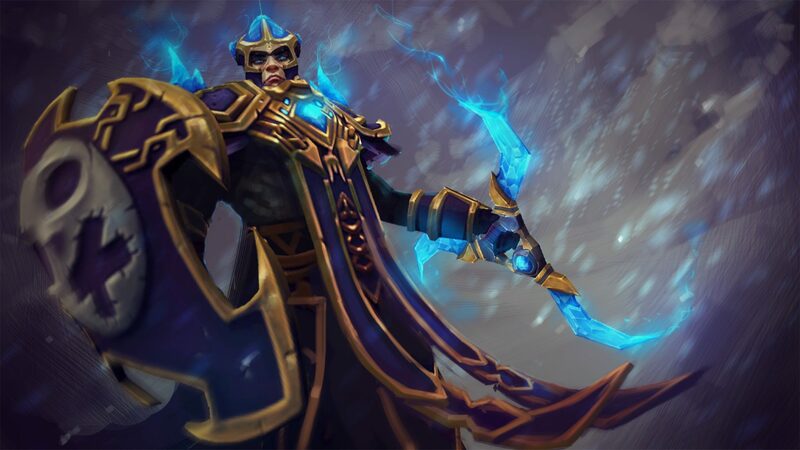 Glaives of Wisdom has a component which allows him to steal intelligence from enemy heroes permanently, should they perish within a 925 unit radius of Silencer himself. The intelligence is added straight to Silencer’s own total, thus increasing his attack damage, available mana, and most importantly, the bonus damage from Glaives of Wisdom. With enough stolen intelligence, Silencer becomes a ridiculously powerful hitter, capable of bringing even the most heavily-armored enemies to their knees. Moreover, heroes that lose too much intelligence can find themselves with no mana after one or two spells, making it difficult for them to pull their usual combos off without aid from items like Arcane Boots or Guardian Greaves. Even with all these amazing benefits, though, picking Silencer does have its caveats. For one, Silencer is heavily dependent on having a good start to the game, due to the fact that he relies on stolen intelligence to do the bulk of his mid to late game scaling. He also has no escape mechanism, which makes either a Blink Dagger, Force Staff, or Shadow Blade pretty much a necessity depending on which role he’s in. Black King Bar counters everything in his kit, too—unless he has Aghanim’s Scepter, which gives Glaives of Wisdom spell immunity piercing properties. Still, there are plenty of reasons to consider Silencer in your draft, thanks primarily to his innate versatility and ability to scale even without that many items. When the mages are at your gates and are threatening to bust through the door, the champion of Aeol Drias might just be the ace you need up your sleeve. Silencer’s skill progression will depend on what role he is assigned to in the draft, though thankfully the differences are quite minimal. The paths diverge in terms of the timing between Glaives of Wisdom and Last Word, with the former ability being left alone until Level 11 in case the Silencer will be a support. Aside from that, the builds are essentially identical. That said, this section guide will assume that Silencer is to be played in a core role—though an alternate skill build for support players will also be provided. Core Silencer will typically want to take Glaives of Wisdom as the first ability, as it helps quite a bit in the war for last hits in the laning phase. Don’t be afraid of the mana cost—it’s nothing that Silencer’s high base mana pool can’t handle early on. Just don’t have it on autocast, obviously, because that would push the lane towards the other side and drain your mana unnecessarily fast. From there, you can easily leave it alone until later. The other two abilities are far more valuable before Level 8. Arcane Curse will therefore be next, and should be maxed out first because of its strong harassment attributes. The skill point at Level 4 should go to Last Word, which is also used to harass enemies out of the lane. At Level 1, Last Word actually deals surprisingly good damage, at a fairly decent mana cost. For cores, though, it’s more important to max out Glaives before Last Word, so for now leave it at Level 1. Glaives should be done by Level 11, which will be followed by Last Word at Level 16. Global Silence should of course be taken at every ultimate level, in order to maximize its duration as soon as possible. For the most part, core Silencer will focus on items that pump up stats (particularly intelligence for additional Glaives of Wisdom damage) and attack speed. The latter in particular is very important, considering that Arcane Curse is the only way for Silencer to slow enemies down outside of items. Without the necessary attack speed, he can be kited fairly easily by the opponent, and his damage output is much smaller than it would be otherwise. The rest of his inventory will go towards self-protection items, or mobility items like Force Staff and Shadow Blade. During the laning phase, your foremost concern is to get last hits with Glaives of Wisdom, in order to get the farm you need for a Shadow Blade. Don’t underestimate your early game prowess, though—you can easily go for kills in the lane when paired with a support hero or by rotating from the middle lane. Doing so nets you additional intelligence early on, which is always a good thing due to Silencer’s somewhat snowball-reliant design. But back to Shadow Blade: this item gives you an escape/initiation mechanism, increased attack speed, and a solid amount of burst damage all in one fairly affordable package. Forcing the opposing team to buy detection can add up in surprising ways, too. Later on, Shadow Blade can be upgraded to a Silver Edge, should there be a critical passive ability on the other team that you need to deal with. Going into the mid game with your Shadow Blade, the next item to aim for is Force Staff, which adds even more intelligence and another handy escape/initiation mechanism. Of course, this should be paired with a Dragon Lance shortly after, in order to build Hurricane Pike—one of the best items in the game for Silencer. With it, you can eliminate the range difference between you and an enemy hero for a few seconds, while still being out of harm’s way. Use this on a melee hero for maximum effect. Black King Bar will likely become a necessity in the late game, when enemy heroes have their spells at max level. BKB prevents enemy heroes from nuking you down or disabling you in some form, allowing you to keep dishing out the Pure damage DPS with Glaives of Wisdom. The same goes for Linken’s Sphere against lineups with a few but highly impactful single target spells. Luxury and situational picks will come into play if the game goes really late. For this we recommend a Scythe of Vyse, which greatly boosts your intelligence (and therefore your damage output)—though obviously the most important aspect of the item is the active ability. Having Hex in the late game can be very valuable, against pretty much any enemy hero. A well-placed Hex can instantly turn a game around, provided you and your team can finish the target off in that duration. Bloodthorn is another viable choice, particularly if the rest of your team would benefit greatly from the damage amplification. The effect can be purged with magic immunity, though, so don’t get it if there’s a natural BKB or Manta Style carrier on the other team. Silencer’s combo in a teamfight usually begins with Global Silence, which affords your team a free initiation if the opposing team does not have any mobility items like Blink Dagger or Force Staff. Once you have gotten Global Silence off, that is your team’s cue to come in and use the long silence window to pick off as many enemy heroes as possible. To that end, your other active abilities will come into play. Use Arcane Curse on as many targets as possible, so that each one will be punished for using spells after Global Silence ends. Last Word should go on the target that you need to bring down as soon as possible. Glaives of Wisdom helps you bring the DPS to the teamfight, but because it is blocked by magic immunity you may need to switch your focus from heroes that have BKB activated. Either way, you will want to be somewhat in the thick of things, so that you get as much bonus intelligence as possible when enemy heroes start to die. One of Silencer’s biggest strengths also happens to be one of his worst weaknesses. Glaives of Wisdom is amazing when he has a lot of stolen intelligence—but getting there in the first place is quite the task. Shutting him down in the early game is thus very effective against him. Abuse the fact that he doesn’t have a natural escape mechanism with frequent ganks and rotations. Minimize trading hero kills against Silencer and his team, as by default they get more out of it than you do unless it’s something like a two for five trade. That said, trading with Silencer already dead is fine, so if you manage to remove him from the teamfight first, giving up kills won’t be as big of a deal. Actually, aiming for Silencer first is always a good idea, because not having to worry about Global Silence during a teamfight gives your team way more breathing space. Consider drafting heroes that can flank or jump Silencer from a distance, because smart players will keep Silencer away from potential stuns and disables before a large-scale engagement breaks out. Storm Spirit, Legion Commander, and Bane are just some that fall under this category. As for specific hero counters, carries that aren’t overly reliant on their active abilities are the most obvious ones. Sniper, Phantom Lancer, Ursa, and Slark come to mind in this regard. Likewise, BKB and/or Manta Style wielding-carries like Phantom Assassin, Juggernaut, Sven, and even Broodmother all laugh in Silencer’s face, shrugging off all his spells and hitting him with their regular attacks. Ironically, there is a spellcaster out there that is really good against Silencer: its name is Nyx Assassin. With Mana Burn and the rest of his high magic damage kit, Nyx Assassin can lock Silencer down and turn his large intelligence totals against him in the blink of an eye. Spiked Carapace likewise punishes both Arcane Curse and Last Word, stunning Silencer upon use.